After much thinking, comparing and long waiting, I now finally have my very own notebook! Want to know what it is? 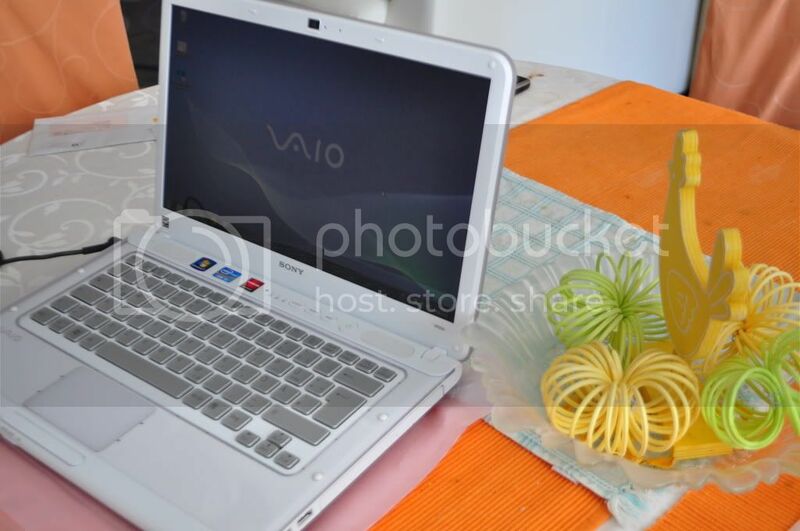 It's a VAIO from Sony. I am loving my new baby. Why? For a number of very good reasons and I am also sure you all will agree. Vikki, as I would like to call it has a 14" LED Display and is powered by an Intel Core i5 2410M / 2.3 GHz processor that can run as fast as 2.9 GHz thanks to Intel Turbo Boost Technology. The hard drive has a 320 GB S-ATA, which is not a problem since I can easily add on a bigger external drive should I need more data space. I love the color, which is white and the way that the keyboard will light up in the dark, making it easier to work even when the room is not so well-lit. The screen backlight also dims a little to save on power when it detects inactivitiy after a few minutes. Although it is a bit heavy at 2.5 kg, it is still easy to carry around because of its slim design. I also have no problems with Internet connectivity because it connects so fast. It also has bluetooth connectivity so you can easily synchronize your smartphone and other gadgets. It runs on Windows 7 Home Premium and is bundled with a bunch of other software. One can also easily connect to internet via the "WEB" key. With a battery life of 3.5 hours, this notebook could go a long away. Now I don't have to worry about missing assignments and tasks especially when we go out of town because I can carry my computer with me. And I won't have any more excuse for not updating my blogs, except maybe during our examination period. I am happy with my Vikki. And I intend to use it as much as I can. :D Have you got a VAIO too? How was it? wow! congrats on your new notebook! i'm drooling over a an iPad tablet. ;D happy for you!